The Samsung ME89F-1B offers a mid sized capacity of 23 litres, together with 800w of power and a smart and sleek black finish. Smart finish, looks good and works well. The buttons are not well labelled - a bit confusing at first - although we soon got the hang of it. The Samsung ME89F-1B is priced at around the £90 mark, providing a spacious 23 litre capacity, 800w of power and a sleek black finish. Samsung's Triple Distribution System helps to provide an even heating and cooking experience - meaning that there are no cold or uncooked spots, due to the microwave cooking from three angles as opposed to one. The ceramic enamel interior is very easy to clean, and the overall stealth like black finish was met with approval from our testers. The one minor complaint we have with this model is that the controls are not very well labelled, using symbols instead of text, which may make this microwave a little difficult to operate initially for some users. It features six different power levels, eight auto cook programs and four auto defrost programs - so enough options for the majority of users. Build quality is pretty good, and overall it performed well during the test period. So who is it aimed at? With a mid sized capacity it may be slightly too small for larger families and households - however for mid sized households it should be fine. 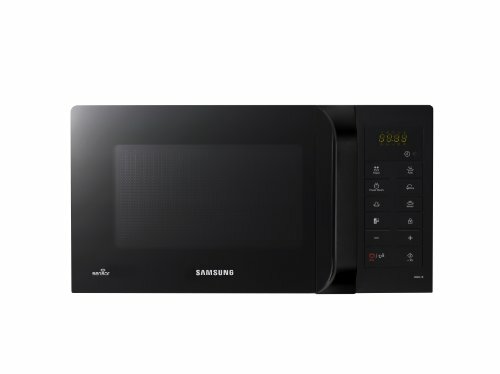 Asides from the controls being a touch confusing, the ME89F-1B is a well built microwave which cooks well, and worth considering if you're looking to buy a mid sized solo microwave. What is the maximum plate size that it can take please? The turntable of this model is 11 inches (or approximately 28 cm) in diameter – so plates of this size should fit comfortably.